Dr Mahesh completed his M.B.B.S and M.S in Surgery from the prestigious M.S. Ramiah Medical College, Bangalore (RG University of Health Sciences), India. He went on to attain his Membership at the Royal College of Surgeons (MRCS), Edinburgh, UK followed by a Diploma in Minimal Access Surgery. Later, he started working as a teaching faculty in medical colleges in Kerala India. His vast experience includes performing more than 1000 minimal access surgeries apart from other complex general surgery cases. He is also trained in the management of various venous disorders of the limbs in UK and currently practices radio frequency ablation of varicose veins. His areas of interest include minimal access surgeries (laparoscopy), day care procedures (laparoscopic hernia, varicocele gall bladder), venous diseases of lower limb and thyroid surgeries. 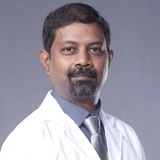 Dr Mahesh can speak English, Hindi, Malayalam and Tamil.